One step closer to finding a challenger for Magnus! It was a far calmer day today as only one of the four games ended decisively. Grischuk beat Wesley So to make up for losing to Kramnik yesterday while all the other games were drawn. The early leaders are still the three winners from the first round: Kramnik, Mamedyarov and Caruana. This was a battle of two players that lost in the first round who were looking to turn their tournament around. Grischuk got a nice position in the opening and, for the second time in as many games, one of his rooks was sent fearlessly in front of its own pawns. Grischuk won a piece and So struggled on for another 20 moves before resigning. 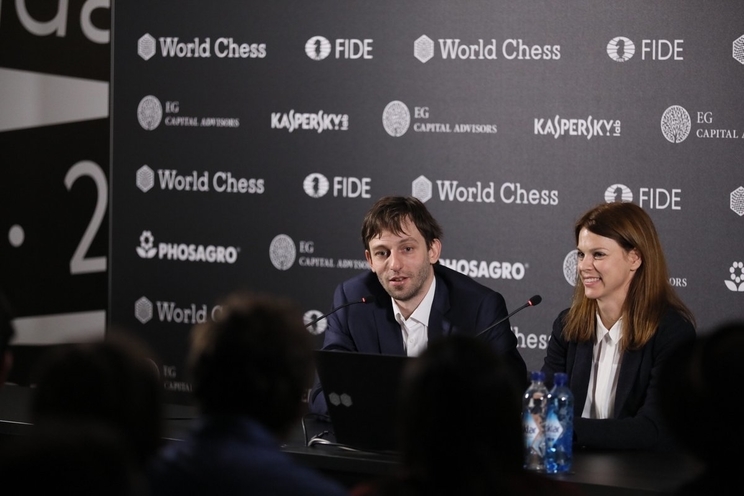 Grischuk will be happy to have pulled himself back up to 50% while Wesley So is searching for answers after starting the tournament with two losses. Caruana started this game off in an exciting fashion by sacrificing the exchange nine moves in. However, it was a theoretically known line and not the sort that leads to a swashbuckling attack. Instead, Fabi simply had good control of the position with the two bishops and, after some maneuvering, the two sides agreed to a draw. Mamedyarov came into this game as one of the early leaders and didn’t seem to want to push too hard. He played an interesting g3-Bh3 maneuver and at one point had aggressively installed his queen on c6. However, the queen was eventually pushed back without incident and the two sides agreed to a draw. This game was another of the dreaded “Berlin endgames” that keep e4 players up at night. Kramnik is usually given credit for popularizing this line in 2000 when he used it to defeat Kasparov in the world championship. It’s only fair that he has to fight against his own creation once in a while. If Kramnik knows a way to refute the defense he didn’t show it today and the players drew after 55 moves. Round 3 starts tomorrow at 15:00 CET. The pairings will be: Aronian - Kramnik, Caruana - Mamedyarov, Karjakin - Grischuk, and So - Ding.